The Future of Catholic Media: An Interview with Father Thomas Rosica, C.S.B. Father Thomas Rosica, C.S.B., is a Canada-based Basilian priest and journalist. He is Chief Executive Officer of Salt and Light Television Network, consulter on the Vatican’s Pontifical Council for Social Communications, English-language assistant to the Holy See Press Office, a member of the Social Communications Commission of the Canadian Conference of Catholic Bishops, and president of Assumption University in Windsor, Ontario. He also served as a newspaper columnist for the Toronto Sun and frequently contributes to newspapers across Canada. Father Rosica holds an undergraduate degree in French and Italian from St. John Fisher College in Rochester, and graduate degrees in theology and Sacred Scripture from Regis College at the University of Toronto, the Pontifical Biblical Institute in Rome and the Ecole Biblique et Archéologique Française de Jérusalem. 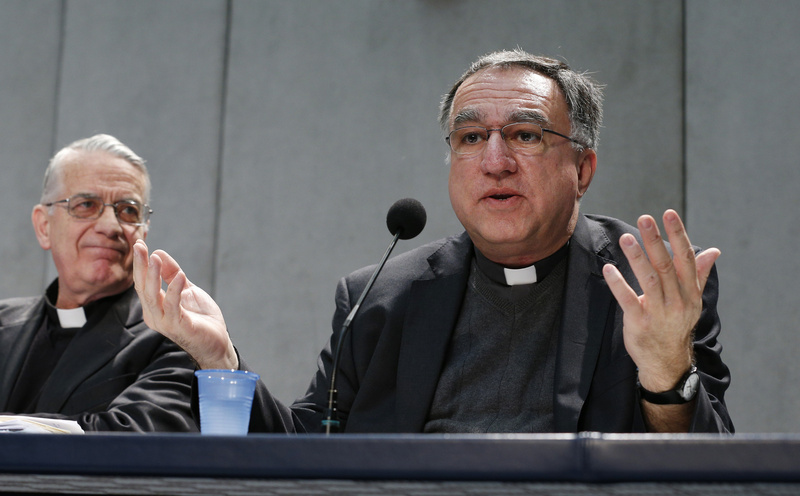 On July 24, I interviewed Father Rosica about his work in America’s editorial offices. The following transcript has been edited for content and length. You’re currently the CEO of Canada’s national Catholic television network, the president of a Catholic university, and an English-language spokesman for the Vatican. Where do you spend most of your time nowadays? Sometimes on a highway or on a plane, but my home base is Toronto, so a lot of the work I do is from there. For the past three years, I’ve had to serve as president of Assumption University in Windsor, Ontario, which is an institution of my religious congregation, the Basilian Fathers. The university was in some difficulty, so my role was to help reorient its mission, establish policies for governance, fortify the Catholic chaplaincy and put the university back on track—which is what I’ve done. But that was a good opportunity for Salt and Light because we used the university as a venue for a number of things. We brought back to life the Christian Culture Series at Assumption University, which was one of the big contributions of that university to the Canadian church. In restoring this historic series, we televised all of the lectures this year and suddenly there’s a buzz about the lectures and about the mission of this Catholic university that exists within the University of Windsor. We’ll continue that in the coming year as well. My role at the university is adapting to the situations now present at Assumption University and my primary responsibilities are Salt and Light Television and serving as Father Federico Lombardi’s assistant at the Holy See Press Office. How are things going at Salt and Light right now? We’re in our 12th year. It’s been a tremendous project, a project of great surprise. I don’t think anyone, including myself, imagined it would develop into what it is. It’s not only a television network, but a Catholic media foundation. We operate on seven platforms. The selling point, the best thing about Salt and Light is that it’s led by a group of young adults. It was the first fruit of the World Youth Day in Canada in 2002, when I was privileged to be the CEO and National Director of that blessed event and project. I had no idea I would be asked to start Salt and Light immediately after the adventure of World Youth Day. Really, I have no television background; I’m a university lecturer in scripture! So all I can say is that God has a great sense of humor. But the beauty of Salt and Light has been the young Catholics from all across Canada and from several countries around the world who have formed our team. We broadcast in English, French, Italian, Mandarin and Cantonese. We probably reach 3 million homes in Canada because it’s digital paid television, but even more interesting is the digital audience because we offer live streaming through our website. We know that people from at least 80 countries are also downloading our programs online. For the big papal events, it was over 100 countries. What’s even more important for the New Evangelization is that our Chinese programming is being used in China and in Hong Kong. What does the future look like at Assumption University? Assumption is on the right track now. It’s the original college of the University of Windsor, one of the major state universities in Canada. Assumption University goes back to the 1850s. In 1962, it developed into the University of Windsor, but maintained its Catholic identity and charter at the core of the university. We can offer theology courses, all kinds of education programs for Catholic teachers and an outstanding chaplaincy. Like many Catholic institutions of higher learning, it struggled to find its moorings for several years. We’ve reoriented it and brought it back to the service of the church and the important Basilian charism of education in the service of the church’s mission of evangelization. You joined the Holy See Press Office during the papal transition last year and continue to serve as an English-language assistant there. What’s your current role at the Vatican? After the 2012 synod, I thought that that was it until the morning of February 11, 2013, when Pope Benedict resigned. The following day, the Vatican spokesman Father Federico Lombardi called me and said “come to Rome immediately.” Within 24 hours, I was the English-language person for the papal transition. I had to deal with the English-language press for six weeks in the Holy See Press Office. We had around 6,400 journalists, many of who were English-speaking. It was an incredible experience. Just before I left Rome after the conclave, and before Easter, Father Lombardi said to me: “You’ve developed a relationship with English-language media that we’ve never had before. I want you to continue that in a somewhat official capacity. You will be the English-language assistant to the Holy See Press Office.” He also formally established a Spanish-language assistant, a young priest from Chicago who is serving in that capacity now. I asked “what does that mean?” He said “just continue that relationship.” So what started off as a daily bulletin for several hundred people during the papal transition is now a bulletin with Vatican information and often commentaries on it that I send to about 750 English-language media people every morning. Specifically, it tells them how to understand this information from an English-language perspective, and it’s become a daily teaching and communications instrument. I’ll be the English-language “spokesman” at the Synod on the Family this coming October, working closely with a great Jesuit and mentor to me, Father Lombardi. Has the Vatican’s communications strategy changed or evolved since Francis was elected pope? Yes. Francis is the best thing going for the Catholic Church now in the area of communications. He’s the clearest example of the New Evangelization. If you want to know what the New Evangelization is, it’s not a book, a text or a synod. It’s Francis. What he’s done is forced all of us to rethink the ways we communicate. From a practical point of view, structurally, changes are underway at the Vatican in terms of how the Holy See deals with the world and how the world deals with the church. So this recent commission they just set up—led by British Lord Chris Patten and a team of outside media professionals—is now evaluating the many communications entities in the Vatican, to streamline internal communications and to find better and more effective ways to tell the story of the church to the world around us, not only in reactive but pro-active ways. What are some positive things going on Catholic media these days? One of the best things happening in our part of the world here is what’s happened through America Magazine. This is not a paid service announcement! Since Father Malone has been in charge, he’s raised the profile, the significance and the role of America Magazine—and shown other Catholic publications the importance of partnerships, having a clear vision and being bold and courageous in reaching out. We have nothing to lose in sharing the best of what the Catholic Church has to offer. Having Pope Francis as the leader has helped all those involved in Catholic communications not to be hiding behind walls, trees or stones for fear of the madding crowds, but to reach out and build bridges—not to be afraid to deal with the so-called “media.” A lot of people had gotten into a very dangerous rut where they were stuck in their stories, and it became death-dealing for a lot of Catholic agencies and groups. They were stuck in the same old narratives. In the bigger picture, I think Francis is the hand of divine providence and the Holy Spirit stepping in and saying “enough is enough.” Now is the time to work together, stand up, be proud of being Catholic, interface with the world, communicate and be in dialogue. I recently did a little study of Pope Francis’ homilies and texts to find all of the places where Francis talks about the devil, and one of the interesting things he says is that diabolical works are about monologue. The works of the Spirit are about dialogue. Monologue is all about people speaking to themselves about themselves and speaking about others, not speaking with others. Works of the Spirit are those based on solid dialogue. What you’re saying recalls the aggiornamento of the Second Vatican Council in throwing open the windows of the church to the outside world. Would you say that Catholic media is finally catching up with the rest of the church on this one? It is. It took 50 years and, in church history, 50 years is not a big period of time. For us, we’re impatient. But it took 50 years and I really believe, with the coming of Pope Francis, that this is that third epoch that Karl Rahner talked about in “The Three Great Epochs of the Church.” In our recent Salt and Light documentary on Pope Francis, we start off the whole story with Rahner’s now-epic essay in which he speaks about the three great epochs of church history. What are some challenges for Catholic media today? The first challenge, a very practical challenge, is to not just talk a good line about getting laypeople involved in church communications and not put our money where are mouth is. If we want to get laypeople involved, we have to make priorities for budgets and funding. We can’t spend all of our time eliminating or putting Catholic media efforts in second and third place. We have to speak about preparing professional people to be involved in these roles. Second, the old guard has to have the humility to step back and let the new generation come in. The third challenge is the risk of doing cute things with social media as if social media is going to be the true method of communication. We don’t tweet to do cute things; we tweet to send people back to links with solid content. One of the problems of social media is there’s not a lot of content. So the church has to be careful about not being caught up in that maelstrom or wave of saying we have 10,000 Twitter followers, 2 million intimate friends on Facebook or similar rather meaningless statements. Well, it may sound good, but what’s underneath all of that? I think the church runs the risk of being caught up in that numbers game. How do we prepare solid, comprehensible, creative content that leaves our readers and viewers desiring something more? What are your hopes for the future of Catholic media? We have to operate on many platforms. We can’t dismiss print media. It’s still valid, people still want something in their hands to read, but it’s just one way. We have to tell our stories and shout the news from the rooftops. That means you have to do it from every medium that’s possible and available. Therefore, it requires people to be proficient in all of those areas. Even older media and communications people who were not aware of the new platforms must become proficient in those areas. I view the work we’re doing at Salt and Light as education in the church’s mission of evangelization. I never consider communications to be some secondary or tertiary thing. It’s teaching; it’s another way to teach. Some people have said to me, “it’s too bad that you're not teaching anymore since you taught scripture so well for 18 years in the faculty of theology at Toronto and in seminary in London, Ontario.” But I constantly tell them: “I am still teaching now. I just can’t see the size of the classroom!” Little did I ever dream of doing this as I sat at the feet of my Jesuit and Dominican masters in Toronto, Rome and Jerusalem!